The aluminum window handles fit PVC plastic, wood and aluminum windows. Also, although there are 8 keys, just one key will work for all of the handles. These handles are for tilt & turn windows and doors - they are NOT compatible with standard sliding windows. In addition to our replacement door / window handles, our extensive range of products includes many other items from the Home and Living department. TILT & TURN: The locking window handles from kwmobile rotate to fit tilt and turn casement windows or doors that open to either the left or the right including inward and outward. AS DOOR HANDLE: Not only do the window operator crank handles work for crank-out windows in your home, but they also work on doors of your terrace, patio or balcony. SCOPE OF DELIVERY: You will receive 4 window crank handles, 8 keys (1 key will work for all cylinders) and 8 screws (screw distance: 1.7" (43mm); spindle length: 1.4" (35mm)). EASY TO INSTALL: The handles are quick and easy to assemble. The handled knobs are compatible with windows or doors made of uPVC plastic, aluminium or wood. 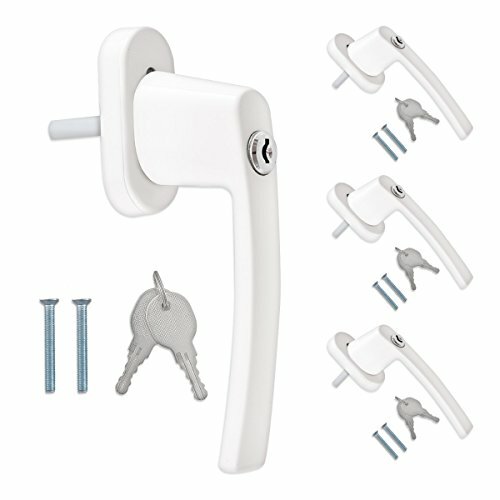 The levers are suitable for all windows with a 0.28" (7mm) square mount. SECURITY: The window locks can be opened using the provided key for added security. A burglar will have a difficult time drilling from the outside and the handles also double as child safety to keep curious kids from dangerous falls. Solid Brass Transom Operator In Satin Nickel.